On the grounds of changing lifestyles & the rising young affluent population, beer stabilizers market dynamics has been witnessing quite a profitable growth graph in the recent years. The skyrocketing rate of beer consumption across the globe has in fact elevated the demand for beer stabilizers for extending the shelf life and removing biological & chemical hazel. With proven records of using stabilizers for controlling or adsorbing the non-biological and biological molecules such as yeast and protein, several industry players are increasingly making use of these products in their beer production processes, which in extension is driving the growth prospects of the beer stabilizers market. With the sharp increasing in beer consumption across the globe, brewers are being increasingly challenged to create a product with a long shelf life with perfect balance between its chemical, microbiological, and physical properties. 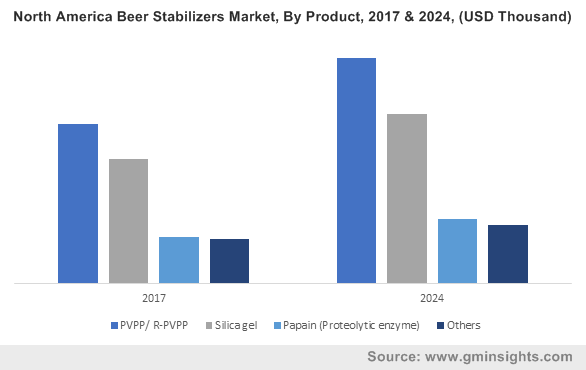 In response to this demand, silica gels and PVPP based beer stabilizers are being extensively used to accomplish beer stability, removing both chemical and biological haze. Speaking along similar lines it is imperative to mention that silica gel is one of the most popular stabilizers witnessing unprecedented demand in this business sphere. In fact, if reports are to be believed, in 2017, silica gel dominated the overall product landscape of beer stabilizers industry, accounting for sales over 3500 tons. Silica gel’s ability to adsorb the hydrophilic haze proteins, which is commonly found in polypeptides and polyphenols, is one of the prominent factors impacting the product demand. Moreover, varied applicability of silica gel in the form of xerogel and hydrogel has also strengthened the product demand. Apart from its favorable characteristics & varied applicability, the easy availability and economic feasibility have also helped the segment foster remarkable growth in the recent years. Considering another important product segment, PVPP beer stabilizers market is projected to record the fastest growth of 5% over 2018-2024. PVPP’s negligible effect on beer flavor, prolonged shelf-life, coupled with the benefit of complete removal by filtration are among the most attributable factors for the overall segment growth. It is prudent to note that Eton Corporation, one of the key players amongst the beer stabilizer industry contenders, introduced BECOSORB® - a silica gel component formulated especially for beer stabilization and filtration. The company claims that its product together with optimum pore volume, makes sure that the protein compounds which might give rise to colloidal haze are adsorbed from the beer. The company’s another product BECOSOL 30, formulated for clarifying beer and improving filtration, has also been making the headways in the global beer stabilizers industry over the past couple of years. A few other prominent names in the global beer stabilizers industry include PQ Corporation, BASF, Ashland, W.R. Grace and Company, Lehmann&Voss&Co, and AB Vickers. With a large number of global and regional players coming up with innovative products and other growth tactics, the competitive landscape of this industry is said to highly fragmented yet intense in nature.